I love dessert... all forms... I don't discriminate. If it's sweet, I'll probably like it. And if it's made from quality ingredients, even better! If you haven't figured it out, I don't believe in depriving myself. If I want something, I'll eat it. But I'm also going to be resonsible about it, and not over do it. This way, I leave feeling guilt-free and totally satisfied... everyone wins! 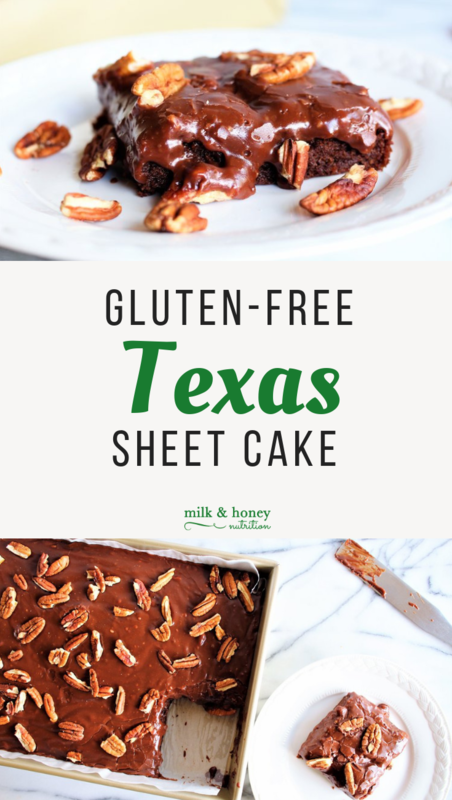 This Gluten Free Texas Sheet Cake is moist, delicious, rich... it's gluten free (duh), can be made dairy free if needed (see instructions below)... and is no where close to healthy. But that's ok. Let yourself have a little (and maybe a little the next day!) and then share it with your friends and family... you'll be their new favorite person... I promise. If you're not familiar with Texas Sheet Cake (also called Texas Ranch Cake sometimes) get ready to have your mind blown! It's the perfect combination of cinnamon, chocolate, and all-around delicious-ness. The cake is extremely moist, but also fluffy. And the icing is what I call "runny/gooey" in the best possible way. If nuts aren't your thing, feel free to skip them... but take it from a cake connoisseur, they're the icing on the cake... or maybe that's the actual icing in this case? Hmmmm. Either way, you won't regret making this cake! Preheat your oven to 350 degrees (325 if you are using a convection oven). Bring the coconut oil, cacao powder, and water to a boil in a small sauce pan. Set aside. In a large bowl, combine the coconut sugar, flour, baking soda, sea salt, and cinnamon. Using a whisk, mix the dry ingredients making sure they are well combined. In a small bowl, combine the buttermilk, vanilla extract, and eggs. Mix to combine. Add the egg mixture to your dry ingredients and stir briefly. Next, add the chocolate mixture. (Make sure it has had a few minutes to cool down...no one wants scrambled eggs in their cake!) Stir the batter until combined. Line a 13x9 pan with parchment paper (or grease with an oil of your choice). Pour the batter into the pan and spread with a spatula to cover the bottom. Bake for 25 minutes or until a knife inserted in the center comes out clean. Once the cake is done baking, remove it from the oven and immediately pour the icing on top, spreading to make sure it covers the entire cake. Sprinkle pecans on top. Let it cool to room temperature before serving. *To make the cake dairy free: substitute 1/2 cup coconut cream plus 1/2 Tbsp vinegar for the buttermilk. *To make the icing dairy free: Substitute coconut cream for the whole milk. *If you do not need the cake to be gluten free, regular wheat baking flour, or all-purpose flour can be substituted.